Busy Week Ahead - Severe Weather Returns! Map Is Courtesy Of The Midland NWS Office. Map Is Courtesy Of The Lubbock NWS Office. Map Is Courtesy Of The El Paso NWS Office. Valid Sun Oct 2 - Fri Oct 7, 2011 PM MDT. Map Is Courtesy Of The NWS HPC. ECMWF 500 MB Fcst Valid At 6 AM MDT Thu Oct 6, 2011. 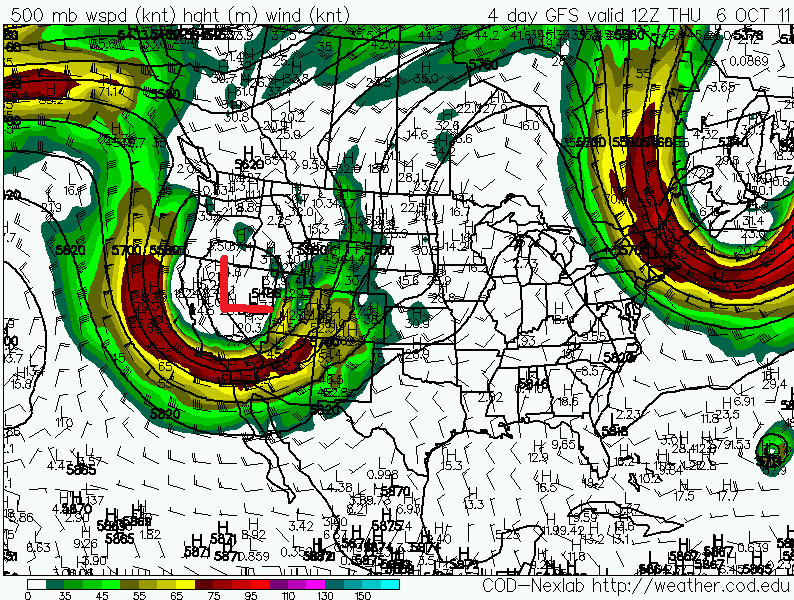 GFS 500 MB Fcst Valid At 6 AM MDT Thu Oct 6, 2011. Video Briefing Courtesy Of The Albuquerque NWS Office. Update @ 9:40 AM MDT Mon Oct 3, 2011. 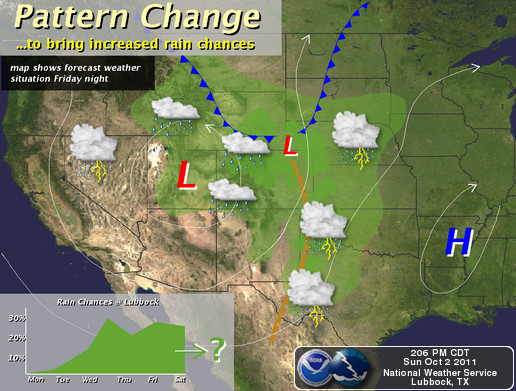 Its complicated, that best describes the upcoming changes in our local weather this week. I thought about writing an update to my blog this morning, but have changed my mind. I think I will wait until either this afternoon, or tomorrow morning to publish a new update on the impending changes. Severe t-storms, locally heavy rainfall along with localized flash flooding, windy and cooler weather, are all still in the cards for this week, especially later in the work week so stay tuned. Overall there really are no significant changes in the overall thinking concerning this weeks potential weather impacts. The details are fuzzy yet, so I will hold off on talking about this. A very active week is coming up weather-wise for New Mexico. A cold and powerful, slow moving upper level storm is forecast to drop southward out of the Pacific Northwest, and into the Desert Southwest this upcoming week. 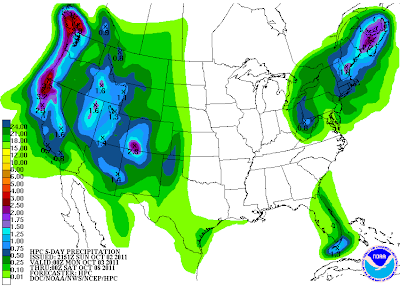 The first round of active weather will come from a negatively tilted upper-level trough of low pressure, that is forecast to move eastward out of southern California, and into the Southern Rockies by Tuesday into Wednesday. 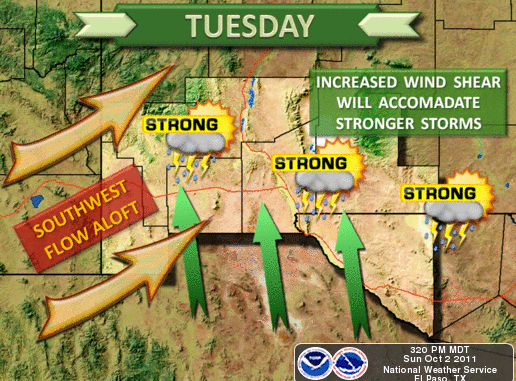 Round one of an active weather pattern will commence across SE NM and W TX by Tuesday afternoon. Showers and t-storms will start to increase across the area as this first upper-level storm approaches. Strong to possibly severe t-storms will be possible Tuesday afternoon into Wednesday across southern New Mexico, and perhaps across parts of the local area. Please visit the El Paso National Weather Service web page for additional details concerning this event across southern New Mexico. 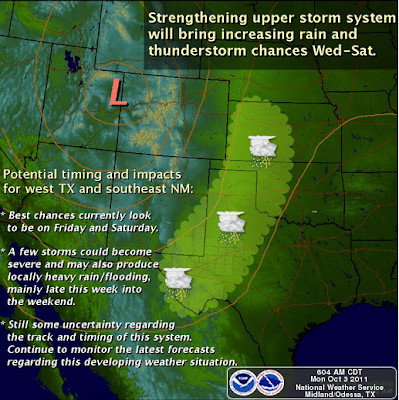 A very active, and likely wet periord of weather is on tap for New Mexico and West Texas. Our chances for good soaking rains are looking good as a powerful, slow moving upper-level storm crawls eastward across the area during this time frame. Multiple rounds of t-storms appear possible from the middle of next week into the end of the week. Some of these possibly becoming severe. With an increasingly unstable atmosphere in place, strong southwesterly flow aloft, along with the dry line draped across NE/E/SE NM and W TX late next week, supercell t-storms look more like a possibility. Widespread beneficial rainfall appears to be a pretty good possibility from the middle of the week into the weekend. Heavy rainfall will be possible in some areas. 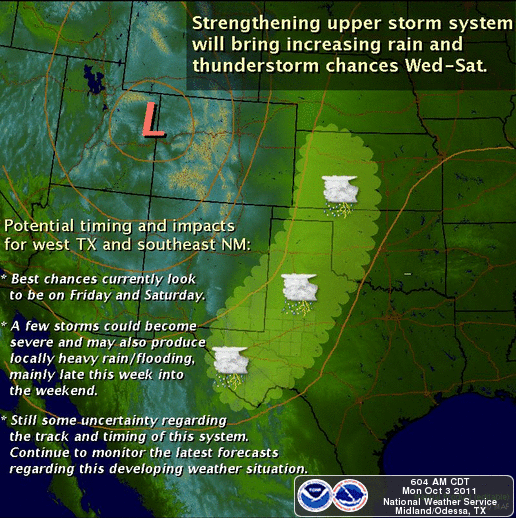 Please visit the Midland National Weather Service , or the Lubbock National Weather Service web pages for additional details concerning this event across southeastern New Mexico and west Texas. 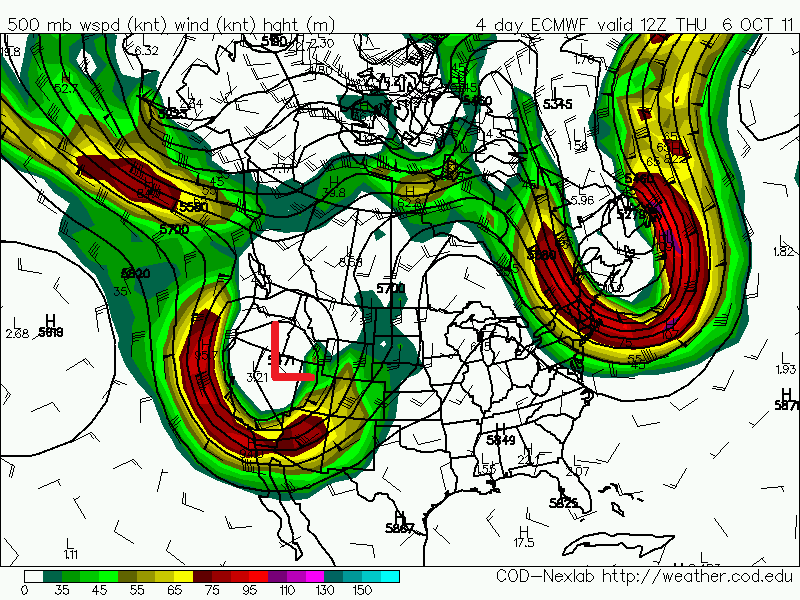 Snow will be a possibility across New Mexico's higher mountain peaks later this week. A stormy week appears to be on tap for the state. Windy weather will return to the state along with periods of rain and t-storms. Please visit the Albuquerque National Weather Service web page for additional details concerning this event that is forecast to impact New Mexico next week.